Master’s Blog – Oh! It was all going so smoothly! Oh, it was going so smoothly! Saturday, 3 March saw attendees of the Court trip to Madeira braving the snow and all reaching Gatwick. The Easyjet plane was delayed 15 minutes and we all assembled at Gate 106. Then calamity – the plane was cancelled due to strong winds in Madeira. We found it virtually impossible to reschedule 22 people to fly the next day either directly or indirectly and there was no guarantee that the wind would abate in Madeira, so we aborted. The Group regrouped four days later for a great dinner at the Carlton Club arranged by Bob Russell and copious Madeira was drunk. The clever souls who made their way on a British Airways flight arrived three hours late and landed, so I am pleased to say the Court Trip went ahead with six people, minus the 22 people on the Easyjet flight. 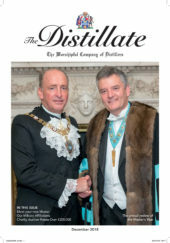 March is one of the peaks of a Master’s year with an invitation, with the Mistress, to Mansion House from the Lord Mayor with all the other Masters and Consorts. It was a magnificent evening. It was also a great honour that evening to be able to sign Liveryman Vincent Keaveny’s election form to be Aldermanic Sheriff. The election takes place on the 25 June and Vincent, if elected, should be our first Distillers’ Sheriff for over 150 years. The following day was the United Guilds Service at St. Paul’s Cathedral. There was plenty of pageantry and the massed voices of the livery world. There was a good turnout of Distillers and many of us went on to have lunch at Brewers’ Hall along with the Coopers. The Master Brewer, Paul Wells, supplied a delicious, spicy beer to accompany the toasts. Traditionally the Masters and Wardens of the Distillers and Vintners meet up for a lunch or dinner once a year. This year it was our turn to host them and we were well fed and watered by the Michelin starred chef Herbert Berger at Innholders’ Hall. It is always a nice way to thank the Vintners for their hospitality, particularly being allowed to use their Hall for many of our events. I was lucky enough to sit next door to the Master Mercer at a Tallow Chandlers lunch, so was able to check that arrangements for our charity whisky auction are in place for April 10th. On the charity side I had a fascinating meeting with Gavin Evans who is Chief Executive of the Barking & Dagenham Onside Youth Zone, which we are supporting from the charity whisky auction. These 21st Century youth clubs have been a huge success around the country and we are helping to support the first one in a deprived part of London, which should open in April 2019. It is always fun to see the next intake of liverymen come through. We carried out interviews and the freedom ceremony with six new candidates, ranging from English Whisky Distillers, to a Fleet Air Arm Commander. One of the highlights of the month was attending the Keepers of the Quaich Banquet at Blair Castle with the Mistress. The new international members of the Keepers were inducted in fitting style with a dinner of whisky, haggis, pipes, singing and “dancing on the tables.” It was a great evening and one that will be remembered for a long time.